California has its share of food festivals. There’s the Gilroy Garlic Festival in July. The Hayward Zuchini Festival in August. 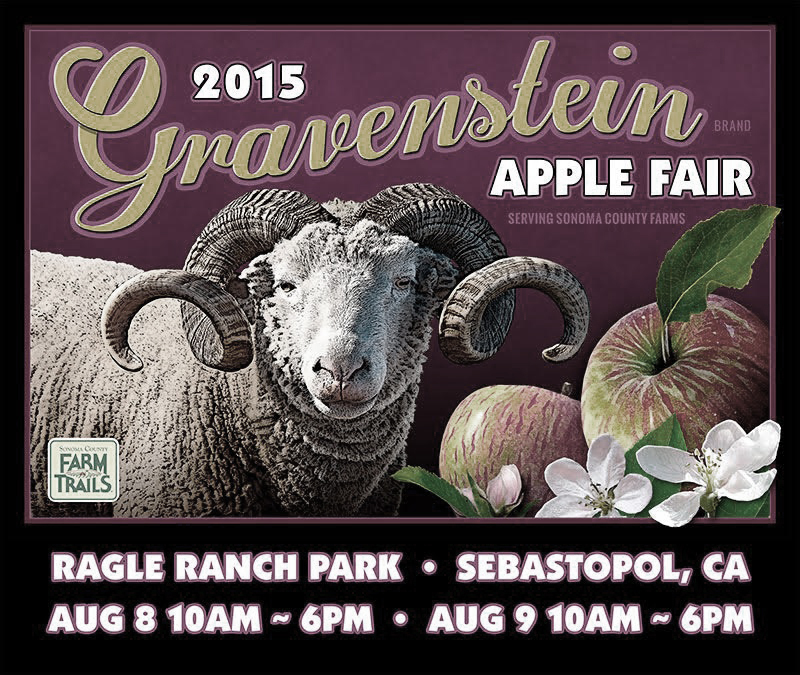 And in September, the Kelseyville Pear Festival. Every month of the year there’s something. Almonds, apricots, asparagus, cheese, citrus, chocolate, craft beer, clam chowder, olives, pumpkins, strawberries, tomatoes, even Spam, they all have festivals of their own. This being West Sonoma County, it’s all about apples. Specifically, the Gravenstein variety. Gravensteins are a cooking apple. Crisp and tart and with a touch of honey, they’re best as a sauce or a cider. Most folks never see Gravensteins because they don’t show well on a supermarket shelf. They’re a dull light green with streaks of red and orange – not terribly appealing to Americans trained to buy fruit with their eyes. They also bruise easily. A week or two after harvest the skin becomes waxy and the flesh turns mealy. So what’s to recommend? We’re here at Ragle Ranch Park to find out. It’s the Gravenstein Apple Festival, a two-day celebration of all things apple — from pies to ice cream to apples covered in caramel and fresh off the tree. 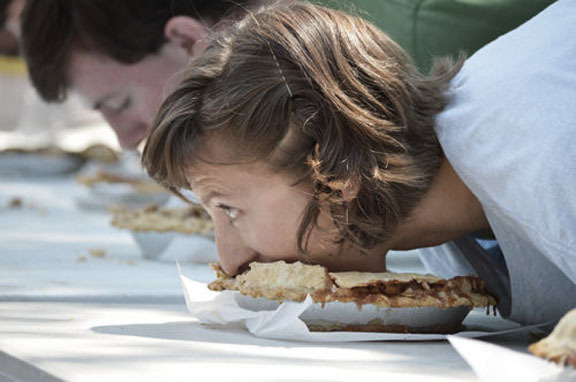 There are contests for apple peeling, apple juggling, candy apple eating, apple pie eating and apple pie baking. Apples are great and all but after an hour or two you really want solid food. Happily there’s a huge variety of food vendors here – grilled pork, BBQ ribs, burgers, wraps, popcorn, teriyaki, tacos, dim sum, you name it. This being Sebastopol there are also lots of vegan options. This being wine country, there’s a wine tent, a craft beer tent and – to keep the theme going – a craft cider tent. Did you know that hard cider is the fastest-growing beverage segment in America today? I didn’t. But tasting through Ace Cider, Devoto Orchards, Specific Gravity, Tilted Shed, Boonville and Troy Cider, I now understand why. Stuff’s delicious.